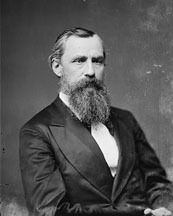 WITHERS, Robert Enoch, (cousin of Thomas Withers Chinn), a Senator from Virginia; born near Lynchburg, Campbell County, Va., September 18, 1821; attended private schools; graduated from the medical department of the University of Virginia at Charlottesville in 1841 and commenced practice in Campbell County; moved to Danville, Pittsylvania County, Va., in 1858; during the Civil War entered the Confederate Army as major of Infantry in 1861 and was promoted to colonel of the Eighteenth Virginia Infantry, which he commanded until retired in consequence of numerous disabling wounds; appointed to command the post at Danville, Va., which position he held until the close of the war; moved to Lynchburg, Va., in 1866 and established the Lynchburg News, a daily paper devoted to the interests of the Conservative Party; nominated for governor by that party, but withdrew; presidential elector on the Democratic ticket in 1872; elected lieutenant governor in 1873; elected as a Democrat to the United States Senate and served from March 4, 1875, to March 3, 1881; unsuccessful candidate for reelection in 1881; chairman, Committee on Pensions (Forty-sixth Congress); appointed by President Grover Cleveland as United States consul at Hong Kong, China, 1885-1889, when he resigned; returned to Wytheville, Wythe County, Va.; died at Ingleside, Wytheville, Va., September 21, 1907; interment in the East End Cemetery. Withers, Robert E. Autobiography of an Octogenarian. Roanoke: Stone Printing Co., 1907.